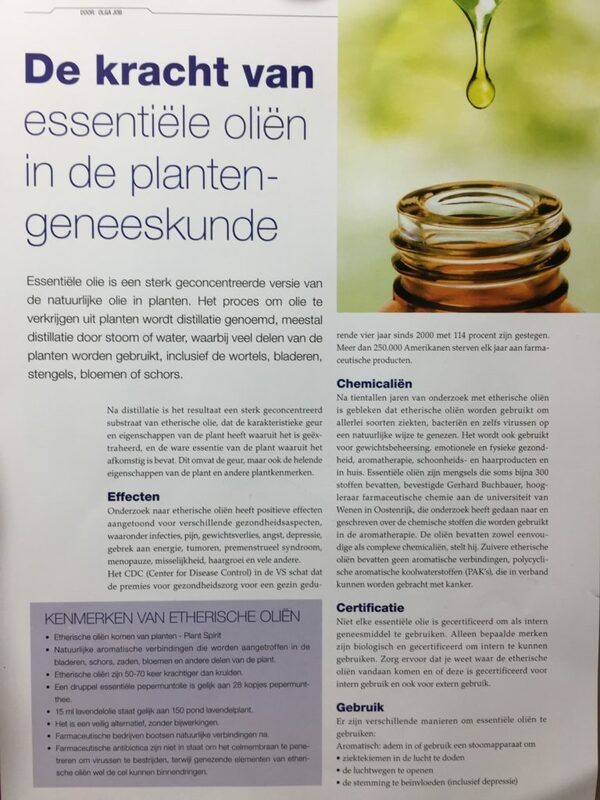 Happy to share my new health magazine article about the Power of Essential Oils and Plant Medicine in the brand new SUPPORT Dutch health magazine edition 52 in page 48 + 49! The new magazine edition is now available for purchase in all supermarkets and book stores in Aruba, Bonaire, or Curaçao. For the Netherlands, you’ll be able to order the magazine for shipment! Don’t forget to pick up your copy today!!! The Power of Essential Oils as Plant Medicine. Essential oils are the highly concentrated version of the natural oils in plants. Getting essential oils from plants is done with a process called distillation, most commonly distillation by steam or water, where many parts of the plants are being used, including the plant roots, leaves, stems, flowers, or bark. After distillation, the outcome is a highly concentrated portion of essential oil, which will have the characteristic fragrance and properties of the plant from which it was extracted, and contain the true essence of the plant it came from. This includes the smell, but also the plant’s healing properties and other plant characteristics. Natural aromatic compounds that are found in the leaves, bark, seeds, flowers and other parts of the plant. Essential oils are 50-70 times more powerful than herbs. 1 drop of peppermint essential oil is equal to 28 cups of peppermint tea. One 15 ml Lavender oil equals 150 lbs of lavender plant. It is a safe alternative, with no side effects. Pharmaceutical companies mimic natural compounds. Pharmaceutical antibiotics are unable to penetrate the cell membrane to fight viruses, but healing elements of essential oils can penetrate the cell. Why use essential oils as alternative medicine? Research studies on essential oils has shown positive effects for a variety of health concerns including infections, pain, weight loss, anxiety, depression, lack of energy, tumors, premenstrual syndrome, menopause, nausea, hair growth and many others. The Center For Disease Control in the USA estimates that health care premiums for a family of four have increased 114% since 2000. Over 250,000 Americans die each year from pharmaceuticals. With decades of research done on essential oils, it has been found that Essential oils are used to naturally cure all types of diseases, bacteria and even viruses. It is also used for weight management, emotional & physical health, aromatherapy, beauty & hair products and home environment. Essential oils are mixtures, sometimes containing almost 300 substances, said Gerhard Buchbauer, a professor of pharmaceutical chemistry at the University of Vienna in Austria, who has researched and written about the chemical compounds used in aromatherapy. The oils contain both simple and complex chemicals, he states. Pure essential oils are free of aromatic compounds called polycyclic aromatic hydrocarbons (PAHs), which may be linked with cancer. How can we use essential oils as holistic medicine? Not every essential oil is certified to use internally as medicine. Only certain brands are organic & certified to be able to use internally. Make sure you know the source of where the essential oils is coming from and if it’s certified to use internally and also externally. Relieves issues in the digestive system, mouth & throat. Interested in experimenting with certified therapeutic essential oils? 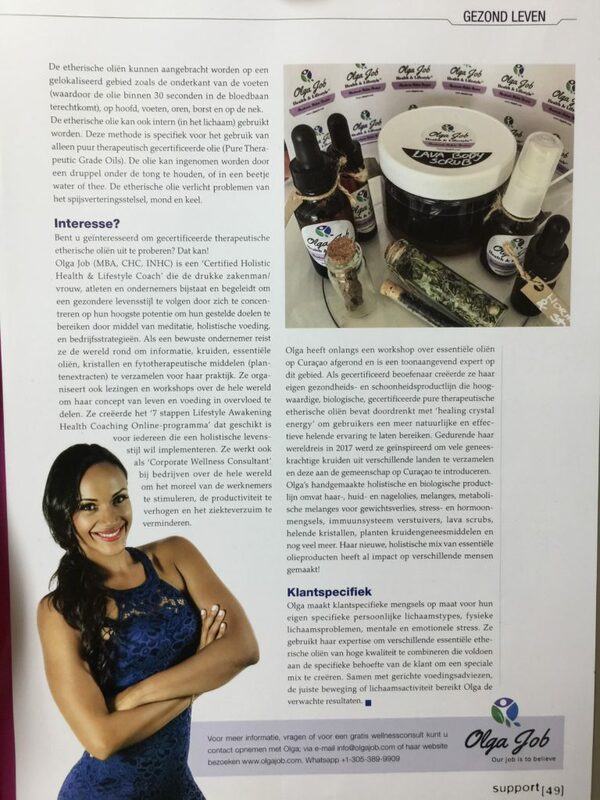 Olga recently completed a workshop about essential oils in Curaçao and is a leading expert on this topic. As a certified practitioner she created her own health and beauty product line that incorporates high quality, organic, certified pure therapeutic grade essential oils infused with healing crystal energy to help users reach a more natural and effective healing experience. Inspired by her world travel tour where she collected plant medicine from diverse countries to bring them to community in Curaçao. 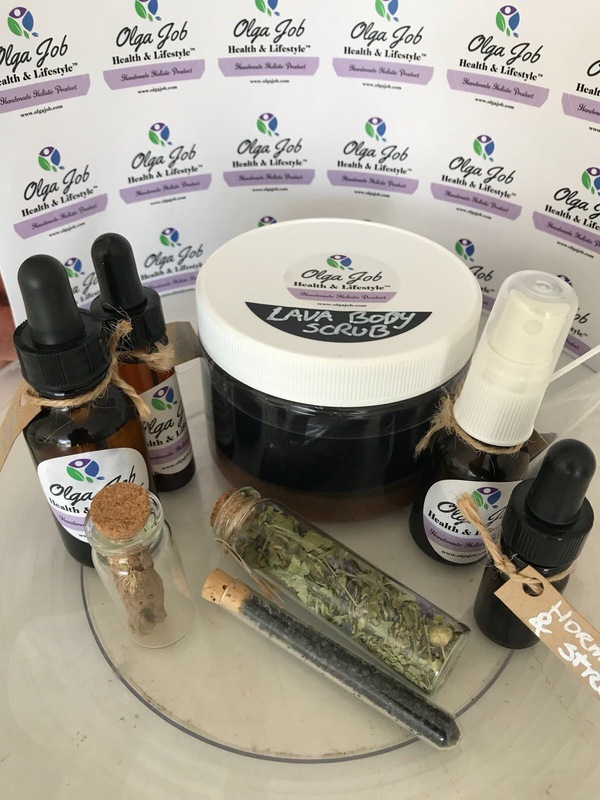 Olga’s handmade holistic & organic product line includes Hair, Skin and Nails oil blends, Weight Loss Metabolic blends, Stress & Hormone blends, Immune System sprays, Lava Salt Body scrubs, Healing Crystals, Plant Herbal medicine and much more. Her new holistic essential oil product blends has already made an impact to people! Want something for your own specific health issues? Olga creates custom made blends upon client’s request for their own specific personal body types, physical body issues, mental and emotional stress. She combines problems that is occurring in the body and uses her expertise to combine several high quality plant essential oils that matches the specific need of the client to create a special blend for people in her community. This results in tackling various issues occurring in the body at one time. via e-mail info@olgajob.com of haar website bezoeken voor meer informatie www.olgajob.com.